“It’s a modified 1924 Allis-Chalmers,” she explained as the Vulcan’s eyes drifted ever so slightly to the dual temperature gauges. “I should step out during the next solo jam and adjust the thermostat,” he mused to himself. 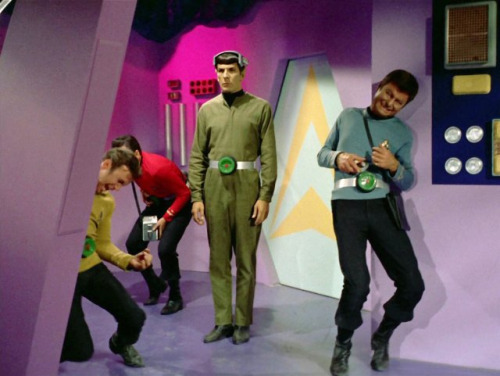 After turning up the air conditioning, The Vulcan found his buddies playing air guitar in the hallway. It made him proud. 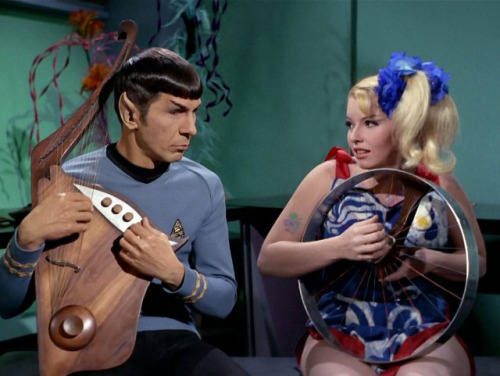 The set ended quickly and when The Vulcan returned, the truth overwhelmed him: she was gone forever. She’d downed her whiskey sours, leaving nothing but lipstick on his empty shot glass and a bar tab of 98 Federation Credits, not counting the tip. “Hit me again, Joe. 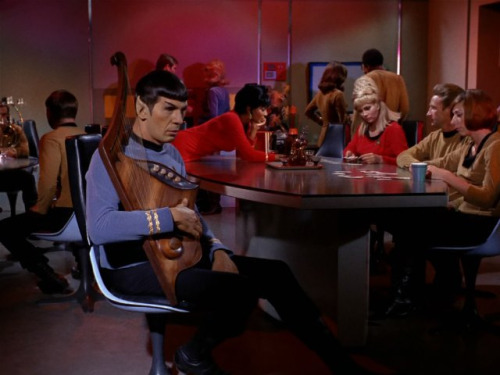 Make it a double,” The Vulcan mumbled to no one in particular. He lit up his last unfiltered Tribble, inhaled deeply, tilted his head back and blew a perfect Figure 8 at the fire sprinkler head above the juke box. For the first time in his life, he grinned – a big toothy Vulcan grin. This entry was posted on Thursday, 30 April 2015 at 12:05 AM and is filed under A Bunk Original, Bizarre, Captain Kirk, Odd, Retro. You can follow any responses to this entry through the RSS 2.0 feed. You can leave a response, or trackback from your own site. Brilliant! I had a narrative in mind with these– had a similar thought about the middle one. Nice job.